Olympic fencing, originally an ancient sport, combines today’s classical combat with modern technology. For centuries fencing was widely practiced at traditional European schools in France, Germany, Hungary, Poland, Romania and Russia. The sport has enjoyed growing popularity in the USA mainly in the last decade, after US saber fencers Mariel Zagunis and Sada Jacobson medaled at the 2004 Olympic Games in Athens. The US Fencing Team won more medals at the 2008 Beijing and 2012 London Olympic Games. Even President Obama was inspired to fence at the White House with one of US Olympians, Tim Morehouse. Today fencing is truly an international sport. The descendant of the dueling sword, epée is the heaviest of the three weapons, weighing approximately 27 ounces. 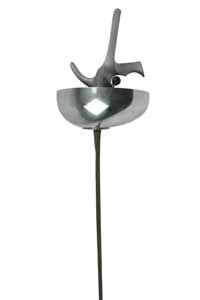 It has a larger bell shaped guard and a much stiffer blade. Touches are scored with the tip of the blade anywhere on the opponent’s body, from the top of the head to the tip of the toe. In epée the fencing strip (area where a fencing bout takes place) is metallic in order to prove when the blade touches the ground instead of the opponent (invalid point). 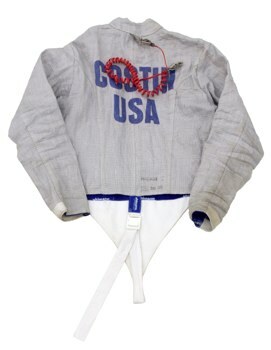 In addition to the regular protective gear, épée fencers use an electric body cord that connects the weapon to the scoring machine. 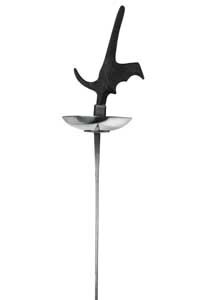 A thrusting sword, like the epée, with a flexible rectangular blade, weighing less than one pound (16 ounces) and with a smaller guard. The valid target area is the torso, from the shoulders to the groin, front and back. It does not include the arms, neck, head or legs. Touches are scored similar to epée by using the tip of the blade. Like epée, the foil is connected by a body cord to the scoring machine. 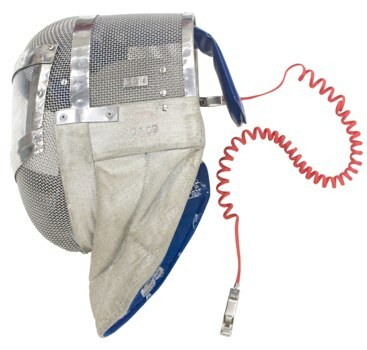 Additionally a metallic vest, called a lamé, which covers the target area, so that a valid touch will register on the scoring machine, and an electric fencing mask is being used. The modern version of the slashing cavalry sword, similar in length and weight to the foil. The guard curves over the handle to protect the fist. Saber is a “thrusting” weapon as well as a “cutting” weapon (using the tip as well as the side of the blade). The target area is from the waist line up, including the arms, to the top of the head, simulating the cavalry rider on a horse. The saber fencer’s uniform includes a sleeved metallic jacket (lamé) on top of the regular one, which covers the target area to register valid touches on the scoring machine. The mask is different from foil and epée with an entire metallic covering, since the head is a valid target area, too. In addition to a body cord, a mask clip is used to connect the metallic mask to the jacket and continue the electric circuit to the scoring machine.